A friend made her own candy corn for Halloween. 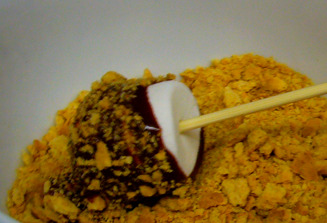 I pulled out the fondue set to make s’mores with melted chocolate, marshmallows, graham cracker crumbs, and bamboo skewers. Quick and easy chocolate fondue: I didn’t bother with a double-boiler and simply broke two bars of bittersweet Scharffenberger chocolate into a saucepan and covered it with heavy whipping cream, then melted it, stirring constantly, over low heat. 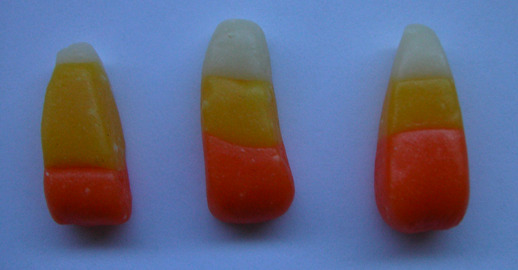 Ha ha, that candy corn looks "special" but very cute.